Introduced via ship ballast in the late 1700s or early 1800s. ​This plant is illegal to sell, trade, plant, or share in Michigan, per Michigan's Natural Resources Environmental Protection Act (Part 413 of Act 451). What problems does invasive phragmites cause? Like most invasive plants on the Top 20 list for the region, phragmites forms monocultures that replace native plants in high quality natural areas, which in turn reduces critical food resources for birds, butterflies, and other wild creatures. Invasive phragmites can “clog” wetlands; it’s incredibly numerous stems and rhizomes catch sediments, eventually filling in small waterways. Its height and thickness can prevent waterfowl from using invaded areas as a home or a stopping point. These factors affect humans as well; it’s more difficult to access wetlands, views from waterside properties are impeded, and the dead stems and leaves are extremely flammable, contributing to intense fires on the East Coast and even in southern Michigan. What does phragmites look like? 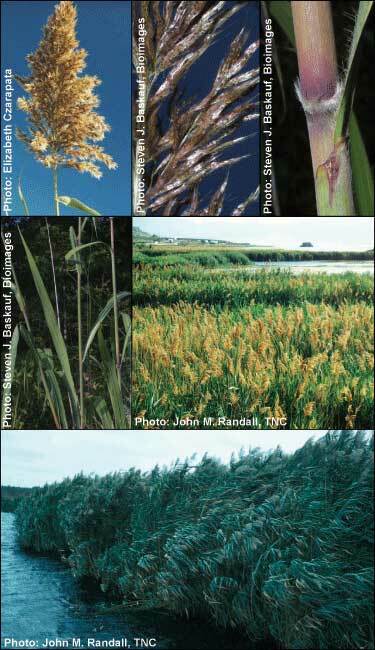 Phragmites is a tall grass, easily growing over 6 ft. tall, often up to 13 ft. Stems are light and hollow and often a dull yellow color. Leaf bases clasp the stem, and leaf blades are between 10 and 20 in long. The seed head is most easily identified, as it is very large, purple in spring, and fluffy upon maturation of the seeds. There is a subspecies of phragmites that is native to North America that can be very difficult to tell apart from the invader; diagnosis often comes down to the length of ligules and glumes (very small parts of leaves and fruits, respectively). Invasive phragmites forms dense stands of stems and can spread by both seed and sprouting from roots, rhizomes, and fallen stems. Phragmites grows in wetlands, ditches, and stream banks. How do I manage phragmites?